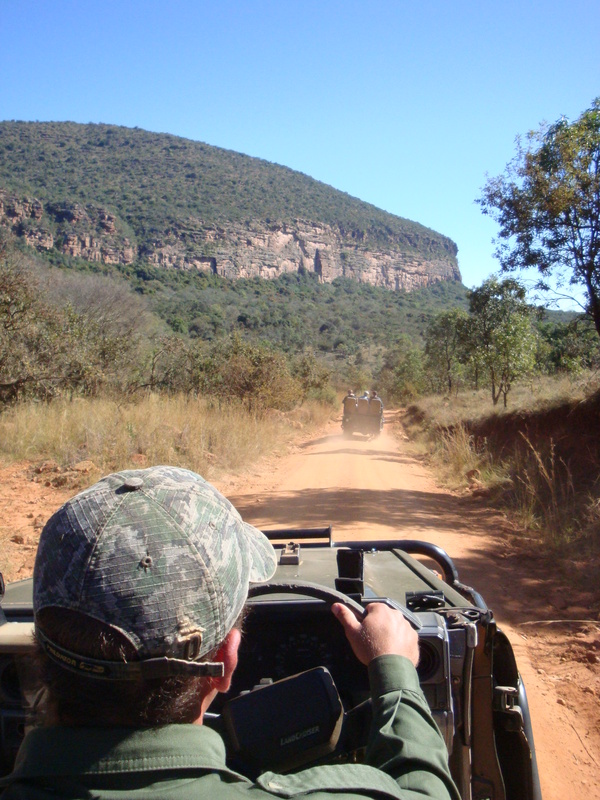 South Africa, Day 10: Headed home. Well, this is it, the last post on the last day in South Africa. For those loyal readers, thanks for sticking with me — I’ll miss telling this story, which only means I have to go on another big, fabulous, exotic trip soon! Stay tuned. Miss a post, or want to read from the beginning? Click here. 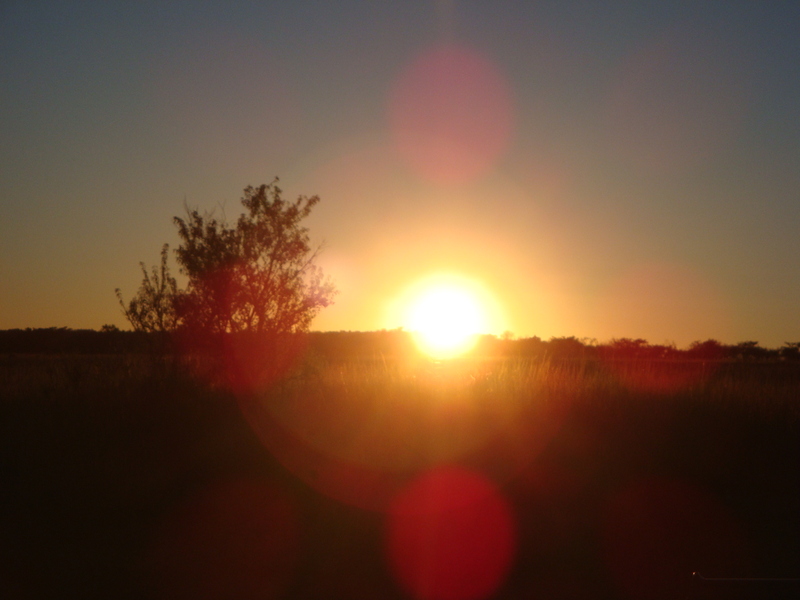 We were awakened again at 5:00 a.m. on our last day at Entabeni. As I sat up in bed, I started to feel the tell-tale scratchy throat that comes with the common cold. Nah, I said, it’s just the dry air. Uh huh. We caught a vehicle and headed for coffee and biscotti at the lodge before the morning game ride. 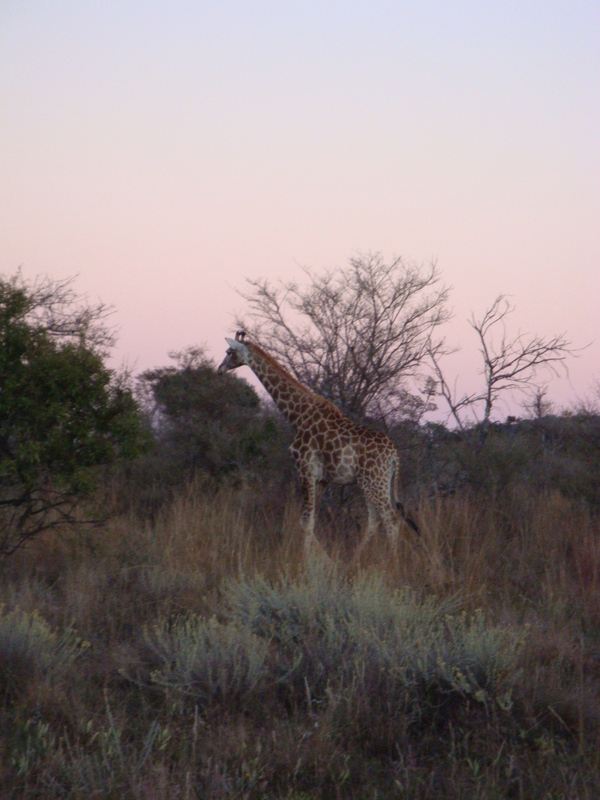 But on the way we encountered a herd of 3 or 4 giraffes, just grazing on the trees there in the dawning light. It was too dark to get a great photo, but they were still a sight to behold. So beautiful and awkward yet graceful. 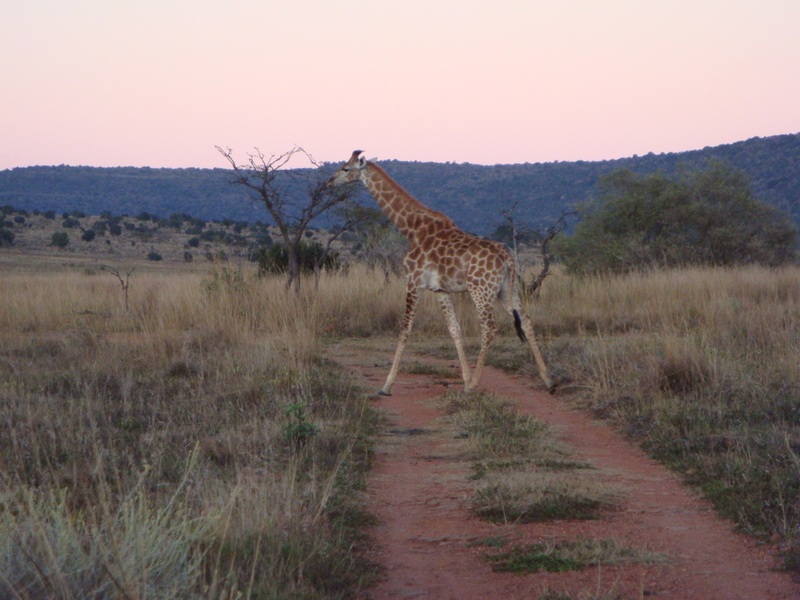 As we pulled out to start the drive, the giraffes were still grazing, so we got some better photos in the sunlight. Just a few feet farther from the lodge we saw some wildebeest in the path … another justification for not walking by yourself! We passed more flocks of impala and wildebeest, which we had seen so often that we began to call them “dogs” and “cats.” Like, eh, already seen it. Where’s the elephants. 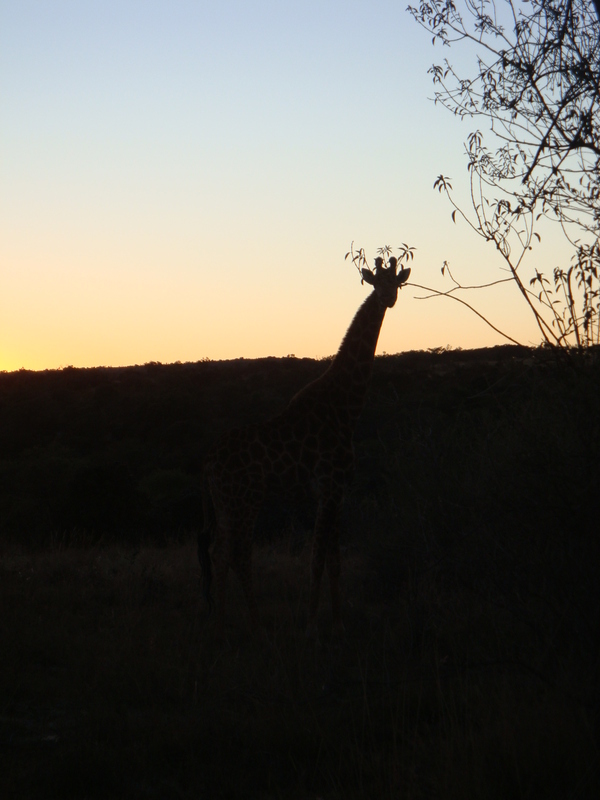 Giraffe, as the sun rises. 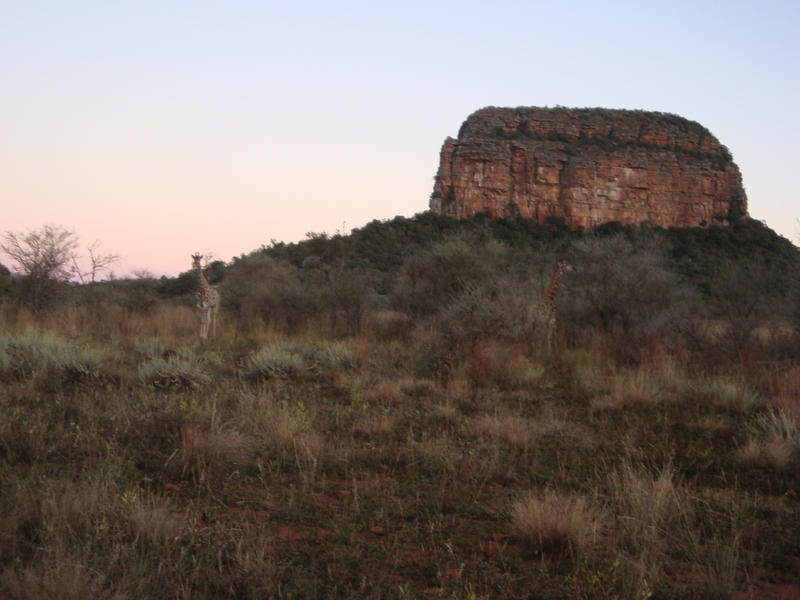 Giraffe, in the shadow of Entabeni. On this ride we headed in a totally different direction. We followed more elephant tracks for awhile, but still never found the herd. 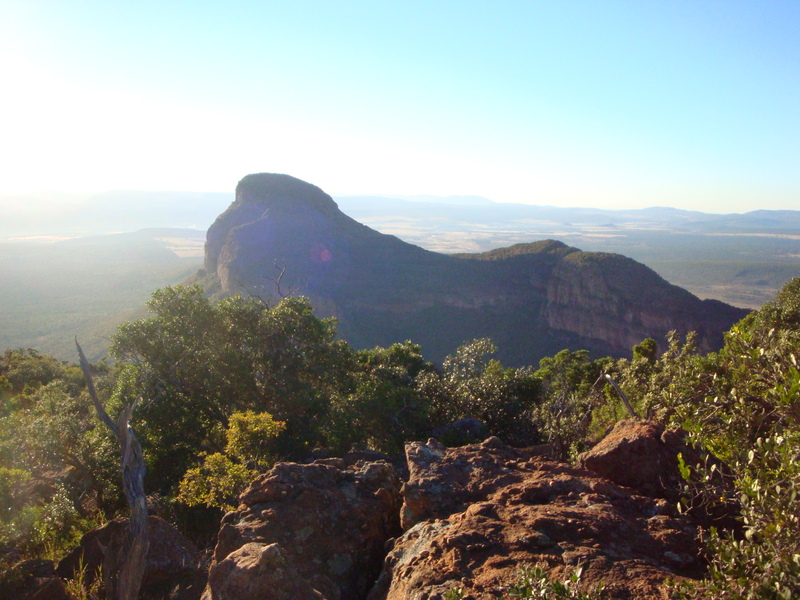 Eventually we climbed some rocky paths and arrived at a lookout point over the valley. Even though it was 6:00 a.m., and I was getting ill, and hadn’t showered, and was wearing every item of clothing I owned, it didn’t matter. That view in the bright sunrise was breathtaking. 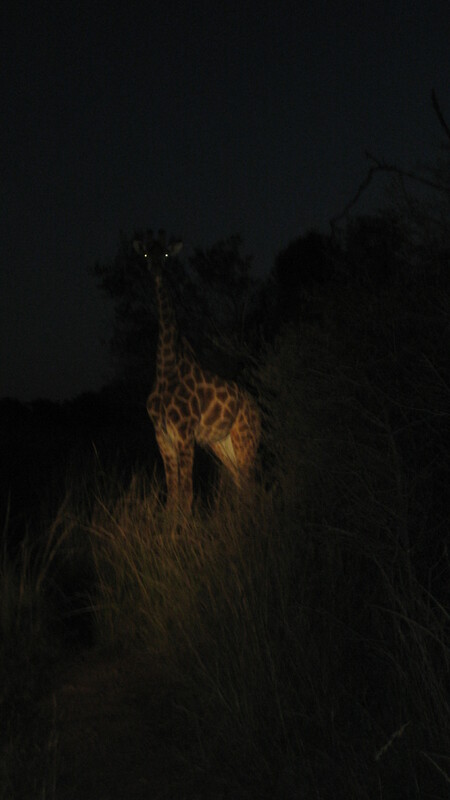 That and the giraffes made the 5:00 a.m. call totally worth it, scratchy throat or no. 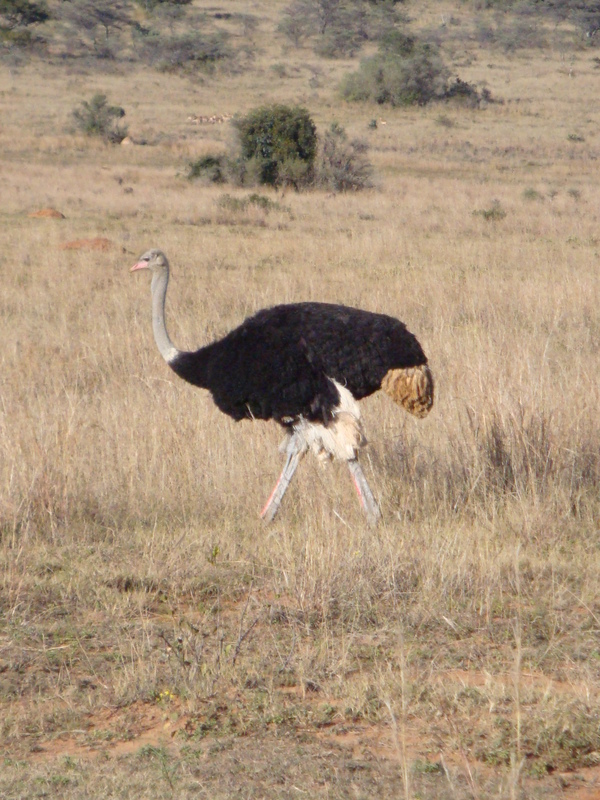 We took photos at the lookout point, then headed back to the lodge, passing the ostrich as she strutted through the fields. 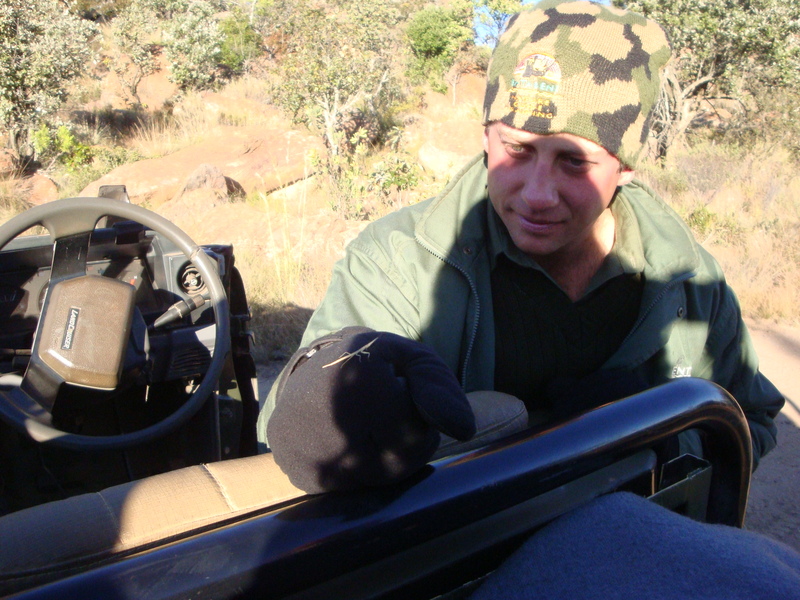 Dewald, showing us a stick insect. Instead of eating breakfast, we returned to our cabins to pack and shower, since that was our last opportunity for bathing over the next 36+ hours. Back at the lodge, our meal was more of a brunch, with meat skewers, rice and made-to-order omelets. As it was the last time we knew for sure that we’d eat that day, we stuffed ourselves. Our luggage was loaded onto vehicles. We all checked out at the front desk and filled the other vehicles to caravan back to our bus. 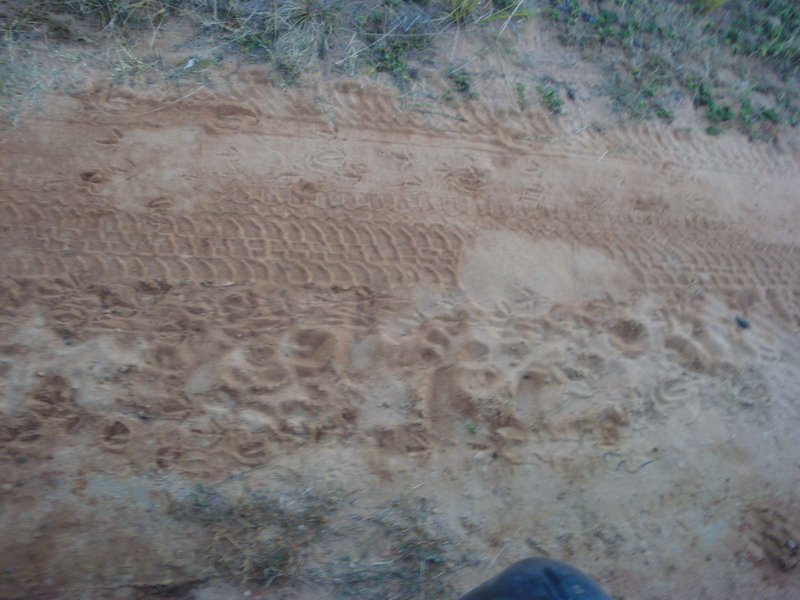 On the trip there — our last, true, mini game ride at Entabeni — we spotted more giraffe, snake tracks in the sand but no more elephants. It didn’t seem real that it was our last day in Africa and that we’d be heading home that evening. I found it both bizarre and bittersweet that I might never travel there again or see the people with whom we’d bonded over the last three days. 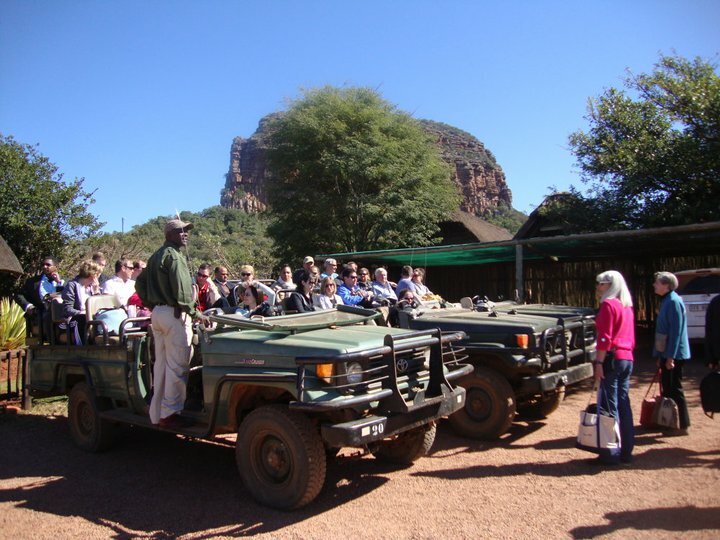 Loading the vehicles, departing Ravineside Lodge. Driving back to the coach. 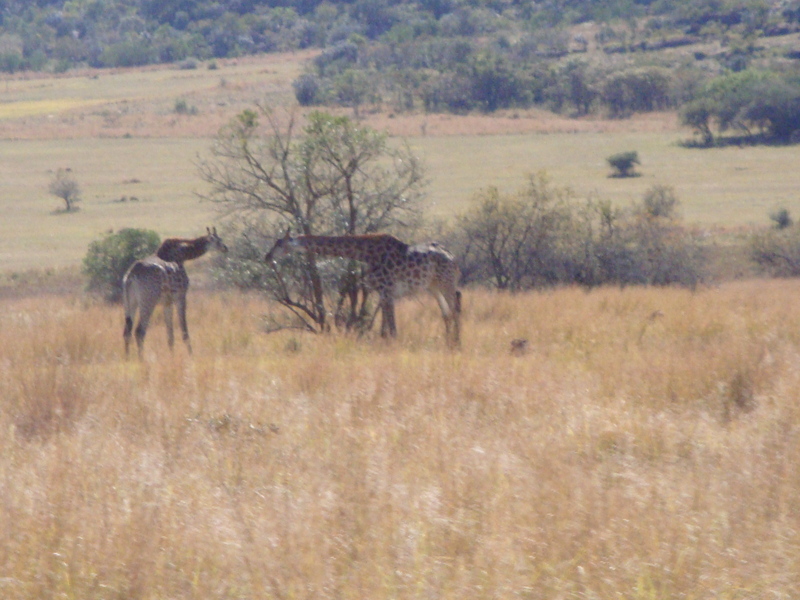 More giraffes, as we depart Entabeni. Once on the bus, I started to feel the full force of sickness, which isn’t surprising given a) the lack of sleep over 10 days and b) continuous exposure to the dry, cold, desert air. There’s no way I couldn’t have gotten sick. I was just relieved that I wouldn’t be stuffy enough yet for the 18-hour plane ride. Trying to pop ears at 45,000 feet would be miserable. We drove back toward Pretoria and Johannesburg, stopping in Hatfield at an outdoor mall/market to shop for more souvenirs and crafts. I really didn’t feel up to it, but I half-heartedly shopped around for more trinkets. Most of our group found their key pieces at that market — and there was a rather hilarious conversation about how we were going to fit/smuggle a 20-pound carved wood elephant piece in someone’s luggage. A group of us gathered for dinner — or whatever meal was at that time of the day — at Ocean Sole, a seafood chain I’d already seen in other cities we visited. I ordered shrimp and calamari, grilled in garlic butter. It took forever to come out, and Johann had to yell at the waitstaff in heated Afrikaans, but it was delicious. Sitting there, my sore throat turned to aches, and I commiserated with a few others who were starting to feel the ick too. At the airport, we bid goodbye to Willy and checked bags to CLT. Inside the airport we kept seeing luggage fully shrink-wrapped, and even some shrink-wrap machines. I doubt TSA would ever let us Americans get away with that. In line, a few of us chatted about all that we’d seen and experienced, and two of my classmates said they are committed to moving to South Africa in the next few years. That’s how touched and connected they felt, and I certainly see why. 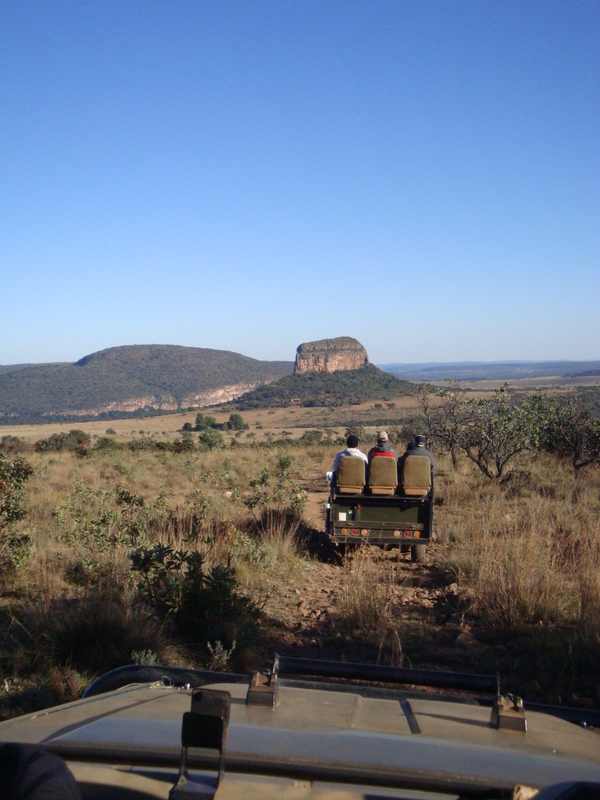 I never had a burning desire to see Africa before, but now that I have I understand the indelible mark it leaves on you. It really changes you, and I hope very much that I will go back there and see more. We did a last-ditch shopping excursion at the overpriced and touristy Out of Africa store in the airport, where I did a desperate grab of gifts and souvenirs to make sure I didn’t leave the continent so empty handed. I continued to regret not buying more at the first market we went to … lesson learned! As we passed through “security,” the guards casually chatted with each other, barely looking at the monitor or at us. No shoes removed, no bags searched. Comforting. 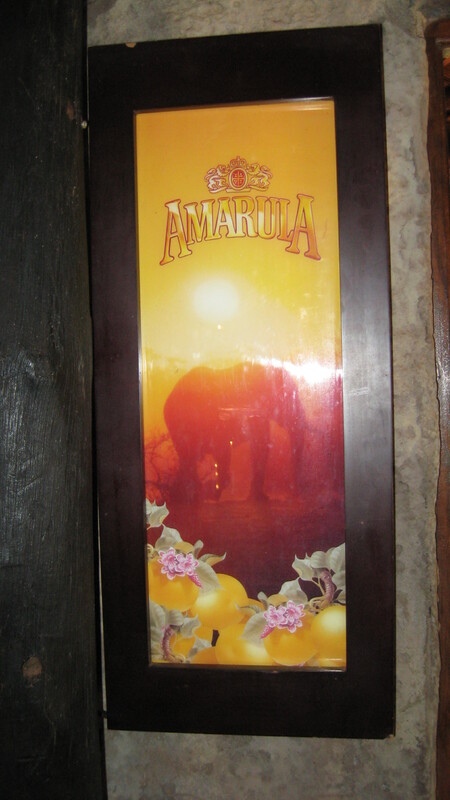 At Entabeni, Willy had told us about a special African liqueur called Amarula, which is sort of like Bailey’s. We never got to taste it, but I grabbed a bottle at Duty Free just because. It’s actually creamy like Bailey’s but so much smoother and softer. Delicious and unique. As we rounded the corner to the U.S. gate, I saw why the prior South African security didn’t really matter. They really don’t mess around when you fly into the United States. The security agents at the gate confiscated every bottle of water, even if purchased in the airport, and did a full pat-down on every passenger. As we passed into the walkway, we were handed laminated cards. Then we passed another checkpoint halfway down the walkway, where we had to hand that card to the agent. Super security. I held out some hope that we’d get an upgraded, new plane on the way home, but my spirits were crushed to see the same, dated interior. I think it was even the same plane. Boo, South African Airways, hiss. Luckily I had bartered with some of my classmates to get my hands on a Benadryl, in hopes that it would ease my sickness and let me sleep all the way home. But then a family with small children took the entire center row right next to me. Of course. Defeated, I put on my earplugs, eye mask and neck pillow and downed my Benadryl to make the world go away. I did get some rest on the flight to Dakar, though fitful because of the rough air coming back across the equator. At Dakar, the family next to me got off the plane, and they sprayed the cabin again. It was just as lovely as the first time. I was still clothed in my eye mask and ear plugs, so I just tried to ignore when the security agents came on board and didn’t just inspect but pulled apart every piece of the seats the family next to me had just left. Like I said, they don’t mess around. Then we all had to pull down our overhead baggage to make sure everything was claimed. It was a little unsettling, but necessary. The Dakar to D.C. leg was better, and smoother. I woke around 5:00 a.m., with another 5 hours to go but in time for breakfast. We landed and cleared customs without incident, then took a short jaunt back to Charlotte. Our group spontaneously cheered when our plane touched down, which probably alarmed our fellow passengers. But, hey, we’d been flying for at least 36 hours. We collected luggage at baggage claim and said some exhausted but heartfelt goodbyes to all of those with whom we’d spent 24 hours a day for the past week. We saw and felt so much on that trip that we just can’t adequately explain or share with anyone else but those 35 people. It was a trip of a lifetime to be sure. The best part is that our group has stayed in touch — five of us have dinner together every month, which we have successfully kept up for the last six. One of the students compiled all of our photos into a shared book for us, and we have discussed creating and selling another photo book to benefit the people we met along our trip. Our group also gathered in the fall for a braai-like reunion party. In some small part those events help us keep our South Africa experience alive, and I hope we’ll continue them for as long as we can.